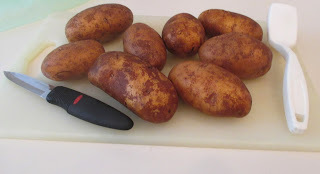 We love potatoes at our house, but I don't eat those highly salted, greasy, and less nutritious processed (peeled) ones that are the customary kind sold in supermarkets. Learn my secret recipe that keeps it simple, economical, healthful, and delicious. It's a home rendition of an old time favorite that's easy to prepare and will bring raves when it's served. I shop organic, because it's important to me that our food comes from a source that hasn't been genetically modified. I know organic food has higher nutrient value and tastes better too. A local health food store and farmers’ market are two of the best places to buy organic potatoes. The organic label means produce like tomatoes, grapes, potatoes, and kale hasn't been chemically sprayed, irradiated, or injected with additives. I make the conscious choice to eat organic foods, because they are in the original state Mother Nature intended. Each time I shop or grow organic I save a small spot of the planet by not polluting the ground, water, air, or my body. I suggest you serve your cottage fries as a snack, a mouthwatering replacement for store bought potato chips. Commercially manufactured chips can be expensive and loaded with oil and/or contain preservatives and additives. 1. Preheat oven to 400 degrees Fahrenheit. While oven is heating, wash and scrub 8 medium russet potatoes. Do not peel potatoes as the skin is high in fiber. Baked potatoes are an excellent source of potassium, vegetable based protein, and important nutrients like Vitamin C and antioxidants. See more at Washington State Potato Commission. Slice, chunk, or cube potatoes into a size and shape you like best. Place in a large bowl filled with cold water, until ready to put in the oven. This prevents potatoes from turning gray (from oxidation). 2. 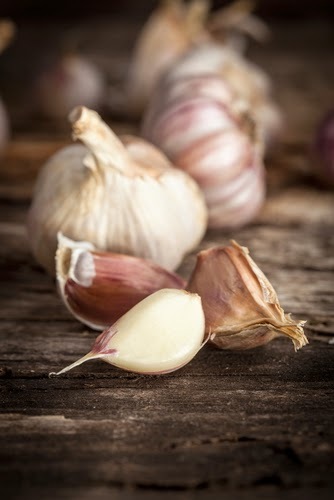 Mix the herbs, garlic, salt, and pepper together in a small mixing bowl or cup. 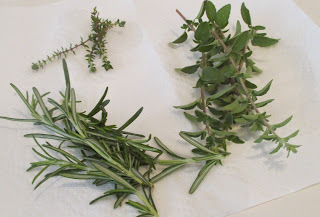 If you don't have fresh herbs on hand, use dried ones. Dried herbs are more potent than fresh ones, so use half strength. If you don't have these herbs on hand, substitute basil, parsley, or tarragon. Each one tastes great on potatoes. Try combos of any or all of them instead. 3. Coat the bottom of a flat baking sheet with 1 Tablespoon of organic olive oil. 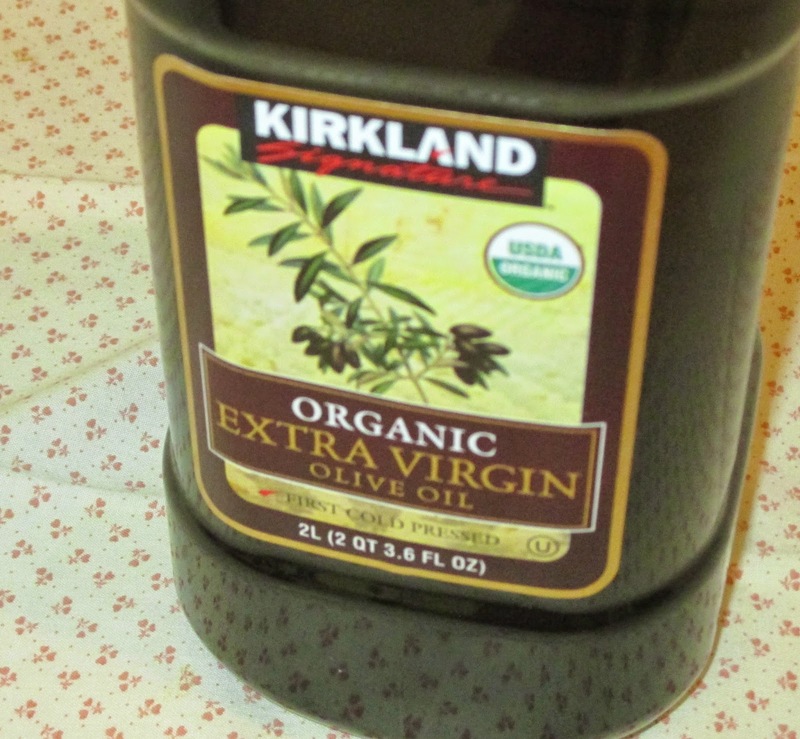 I dip a corner of a paper towel into the oil and use it to spread the oil out evenly. 4. Drain off potato water, coat potatoes with herbs, garlic, salt, and pepper and toss. 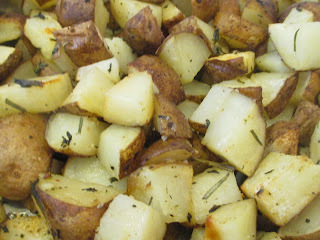 Then pour potatoes onto baking sheet, so they are spread out in one layer. 5. Drizzle the rest of the oil on the potatoes and bake for 10 min. Stir to loosen any potatoes that have stuck to the pan and bake for another 20-25 minutes or until you can easily pierce potatoes with a fork, and outside is golden brown. Cooking times vary depending on how thick the pieces of potatoes are, your oven calibration, and what the total weight of potatoes actually is. Cottage fries look appetizing on a platter or alongside a hummus sandwich or veggie burger. Serve with a green tossed salad to create a plant-based meal everyone will love. A portion is approximately one potato for each person. I always make much more than I need, because I like to freeze individual portions to use later on. Please let me know if you're going to try your hand at making this dish or if you like this recipe. At my house, it's a fantastic accompaniment for dishes like scrambled tofu, lentil and veggie loaf, or pinto beans with broccoli. Please comment below and share the love through Pinterest and Facebook, if you like what you see. Colors of Joy: A Woman's Guide for Self Discovery, Balance, and Bliss. It shows you how to use color, journal writing, affirmations, and reflection to heighten self-awareness, reduce stress, and increase your sense of contentment and gladness.